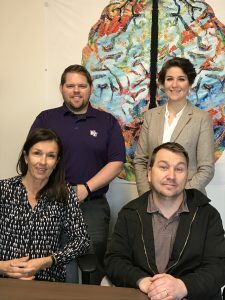 Whittier College’s newest Learning Community, Neurodiversity and Neurotechnology (NNLC), has formed with faculty from the departments of Psychological Sciences, Child Development, and Kinesiology. The NNLC’s goal is to research technology that supports academic success among neurodiverse learners and to aid the reduction of stigmas associated with neurological differences. Sitting from left to right: Dr. Huemer, Dr. Colcord; standing: Dr. Haworth, Dr. Lash. Learners with neurological obstacles such as dyslexia, autism, and ADHD commonly use technology including applications, audio readers, special fonts, and more. The NNLC will also investigate technology that can help reduce the stigma of a diagnosis such as self-help kiosks in public spaces to highlight the prevalence of conditions like anxiety and depression at college campuses and to de-stigmatize mental health problems. The founding WC faculty members are Sabine Huemer and Amanda Lash, Psychological Sciences, Cean Colcord, Child Development, and Joshua Haworth, Kinesiology. Dr. Huemer, Dr. Colcord, and Dr. Haworth share a common interest in autism and learning disabilities research, Dr. Lash contributes with work in the field of audition and perception. Specific goals for the calendar year 2018 include research on the latest, cutting-edge assistive and educational technology, a collaboration with Student Disability Services on a needs analysis, and the identification of outside grants that may help implement innovative technology at Whittier College during the next stage of development. For more information on the NNLC, please contact Sabine Huemer, shuemer@whittier.edu.